On Saturday, March 26, IMAN was honored to host Habib Umar bin Hafiz, a renowned scholar and spiritual leader, currently on his first tour of the United States and Canada. The IMAN visit was the first of his many engagements during a two-day trip to Chicago. IMAN as an organization and many of the individuals – staff, board members, leaders, etc. – associated with it are motivated by “spiritual convictions about community service, human compassion, and social justice.” However, as Rami Nashashibi, IMAN’s Executive Director, noted in his opening remarks during the reception honoring Habib Umar, this spiritual foundation can be weakened by the physical and psychological trials accompanying the day-to-day work for social change and service in our communities. As such, Nashashibi pointed out, this spirituality is constantly in need of rejuvenation and nourishing. He hoped that Shaykh al Habib Umar’s visit to IMAN would provide an opportunity for such rejuvenation. Habib Umar founded and runs Dar al Mustafa, a center for traditional Islamic scholarship that currently hosts an array of international students, in the Hadhramaut valley, along the Gulf of Eden. This area has been a seat of traditional scholarship and learning for centuries. His influence through scholarship and teaching is vast in Indonesia and East Africa. 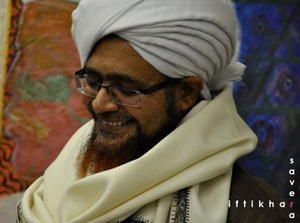 In July 2008, Habib Umar partnered with Muslim Aid Australia as founder of a local non-governmental organization (NGO), Al Rafah Charitable Society, to address issues of poverty and hunger and lack of sufficient health care that affect areas of the Hadhramaut valley. Habib Umar’s visit started with a tour of the IMAN’s offices, including the Health Clinic, and the Project Restore and Green Reentry houses. Toni Foulkes, Alderwoman for the 15th Ward, was also present on this occasion to welcome him to the Southwest Side of Chicago. During the reception that followed, IMAN staff gave Shaykh al Habib Umar an overview of IMAN’s work in the three main areas of direct services, organizing and advocacy, and arts and culture. He seemed moved by IMAN’s commitment to the betterment of the community it is a part of. This became clear as he started his remarks by reminding everyone of the fundamental Muslim dictum that undergirds much of the IMAN work: “Most beloved of God’s creatures to Him are those who are most beneficial to others,” and by thanking IMAN and its staff for “fulfilling a communal obligation upon all Muslims” for building up their communities. In the style of true spiritual teachers, however, he quickly turned his comments to the need for personal and spiritual accountability: “From time to time review your own levels of spiritual ascension, because a Muslim when he is striving [to do good] may become unaware of some of the attributes of his own [internal] quality and state.” He also notes that “attention should be paid to the presence of the heart with the One for whose sake we are doing this [work].” In other words, continue to try and do good, but also keep a check on yourself and your ego, and always remember why and for whom you are doing this work. Sound spiritual and practical advice, indeed. Shaykh al Habib Umar ended his remarks with a prayer that moved many of those present to tears. After the reception, Habib Umar also spoke at an event hosted by IMAN at the Chicago Islamic Center on 63rd Street. This talk was titled “Spirituality & Community Accountability,” and gave the local community a chance to meet and listen to the distinguished scholar. Habib Umar’s visit to the IMAN and his interaction with staff, board members and leaders was just the kind of spiritual renewal, not to mention accountability, that many of those in attendance were hoping for. They felt rejuvenated and ready to take on the formidable challenges that always lie ahead with a renewed sense of purpose and meaning. 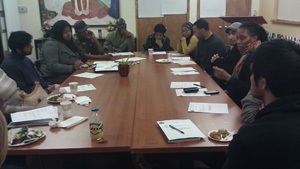 On March 2, 2011 community leaders of all stripes came together for an important steering committee meeting for the Muslim Run campaign. To start, in typical IMAN-style, committee members participated in an ice breaker exercise aimed at highlighting the diversity of talents and passions in the room. It was soon apparent that the committee personnel, from established business leaders to local activists and aspiring healthcare professionals, represented a range of skills and abilities that could be harnessed to further the campaign. After the kickoff activity, leaders of the various tracks presented updates, with a focus on track objectives, strategies and next steps. Ameenah Muhammad, head of the policy and advocacy track, spoke of the efforts underway to ensure that a portion of the Fresh Food Fund be allocated to local community businesses. The track drafted a letter and solicited several hundred signatures in support of funds being allocated to small businesses, as opposed to large retailers solely. The letter was presented by a group of IMAN staffers and supporters in-person to a senior policy advisor to Illinois Governor Pat Quinn, in conjunction with the Council of Islamic Organizations of Greater Chicago’s (CIOGC) 3rd Annual Muslim Action Day, in Springfield, IL, on March 9. The next project for this track is to develop a detailed understanding of SNAP (Supplemental Nutrition Assistance Program) certification guidelines to advise and educate local store owners on compliance. Melvin Lyons, leader of the education track, updated the committee on the efforts underway to measure and quantify the impact of the campaign on the local community. The track plans to devise and administer surveys prior to the launch of the campaign’s main efforts, in order to determine a baseline from which to judge the campaign’s efficacy. Ultimately, the perspective of local community members is what’s most important, as they are the individuals whose lives Muslim Run is trying to impact. The surveys are an important tool in gaining local buy-in and support for the process and engaging residents in the campaign. In conjunction with the surveys, the education track is planning on convening residents for a local town hall meeting to help develop a grassroots education curriculum on healthy lifestyle choices. The final track, led by Sheelah Muhammad, is focused on building a sustainable business model for local store owners to profitably offer a wider selection of healthy food options. The track plans to meet in late March with a local business owner who has shown an interest and willingness to cooperate on such an alternative business model. The goal is to solicit feedback, gain perspective and ultimately work in conjunction with that owner to pilot the new model, with the eventual goal of replicating it across a network of 7-10 stores. Not only will this effort help develop a coalition of supporting businesses in the community, but it will also provide invaluable guidance for IMAN in developing its own business at the vacant property at 2747 63rd Street, across the street from the IMAN office. The business committee hopes to begin the planning process for developing that location into a model healthy food store and café in the near future. There is a lot of excitement brewing around the Muslim Run campaign, and as the initiatives underway begin to take shape, there is a real possibility to transform the community in a lasting way. Please stay tuned for more updates. It’s been a really busy March for IMAN’s Community Ambassadors (CAs). Much has transpired since their collective efforts packed the Chicago Urban Art Society for IMAN’s February Community Café. Nevertheless, March jumped off with a trip to Springfield for the Illinois Muslim Action Day. CAs joined young Muslims from around Illinois for a rally in the rotunda of the State Capitol building where Muslim leaders energized the crowd with their inspirational words. Local politicians expressed their support for Muslim Illinoisans, and CAs along with IMAN staff met with local representatives. They also presented Governor Quinn’s office with a petition of almost 400 signatures in support of allocating Fresh Food Funding to neighborhood stores in hopes of increasing the health and wellness of residents and supporting small businesses in local communities. CAs even performed at and supported Café Finjan, an interfaith concert that brought together Muslims, Jews and others in a safe space for artistic performances and reflective dialogue. The show’s intermission offered the diverse crowd a chance to break into small groups and discuss the event’s theme, “Chicago Crossroads,” in relation to their specific life challenges. CAs were happy to give a huge round of applause to fellow ambassadors Ainee Fatima and Emaan Nafees as they captivated the crowd with their spoken word. CAs also got moving with planning efforts for their April 16th health & wellness event, which they’ve titled “Healthy Eats Conscious Beats.” This event will be held at Garifuna Flava Restaurant, a local eatery down the block from IMAN’s office, as CAs are committed to supporting the local community and businesses. They plan to use this event to broadcast the importance of health and wellness to the Chicago Lawn neighborhood. It was also a real treat for CAs to join the brothers from the Green Reentry Project in their efforts to beautify several blocks along South Washtenaw Street. Together, we left a positive imprint on the community, as they scoured blocks picking up trash and debris marking the start of Green Reentry’s larger outreach to the community, which will soon include home weatherization. It’s been a busy March for CAs, but don’t fret there will be much more coming in April. My week, Monday through Friday consists of being at work, in class, doing homework, or trying to catch up on much needed sleep and rest. In between all of that, I manage time as a Community Ambassador. The past few weeks working with IMAN have been inspiring, motivating, and helped keep me sane throughout the week in a world of fast food and plastic. 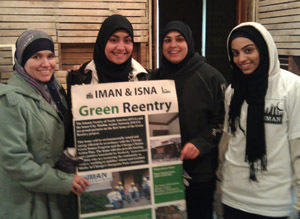 From doing research on the side on Food Deserts to holding random phone conversations in between class to find out whether or not IMAN’s recycling actually gets picked up (which thank God, it does! ), I’m constantly in a position of learning and moving forward. Prior to becoming a Community Ambassador under the Health and Wellness Track, I had no idea what “Muslim Run” was even about. Slowly as the weeks have passed, I’ve begun to realize the depth behind the campaign and the impact it can have on our surrounding communities. I was always pretty passionate about being healthy and recycling yet, working with other Ambassadors has really shown me how much we really need “health” and “wellness”. Visiting the IMAN Health Clinic was one of my major highlights. I had never been before and for the first time I realized what was actually happening behind the closed door of the IMAN office. It’s one thing to know something as an ideology, but another to actually put it into practice. Much of the ideals that I am learning, I have already known. Yet, slowly, they are becoming more of a reality for me. Right now, much of my time is focused on our April 16th event, “Healthy Eats and Conscious Beats” which I am super excited about. Going green, being healthy, promoting health and achieving health is an ongoing process. I realize that everyday. Through my work with IMAN, I am able to put everything I know into practice and actually do something about the things I am most passionate. I look forward to the coming weeks, working with my team, and accomplishing all of our goals!